Wall-mounted tool cabinets are designed to organize your garage or workshop- providing a spacious resource for your hardware, tools, and various supplies (Source). Hanging wall cabinets generally feature 2 or 3 door fronts with a variety of adjustable and fixed shelving elements inside (Source). Unfortunately, buyers we spoke with complained about the quality of many of the hanging tool cabinets- saying that they have often bowed and sagged over time, even when they weren't really overburdened. One that stood above the rest, however, was the Gladiator Tool Cabinet. The Gladiator Tool Cabinet is designed to store everything from car wax to fishing gear. It's built from steel and measures 28" x 12" x 28", providing up to 150 lbs of storage support, with magnetic latches to secure the cabinet doors. It can be mounted mounted directly onto drywall, masonry, or bare studs. Additionally, they are designed to work with Gladiator's Wall Systems- which are wall-mounting track panels that lock Gladiator cabinets, hooks, & shelves securely in place for extra storage space. So you might want to consider implementing that paneling in conjunction with purchasing these Gladiator tool cabinet, but it's not necessary for installation. As far as the interior of the cabinet goes, there are 2 adjustable shelves on the inside- capable of holding up 40 lbs. 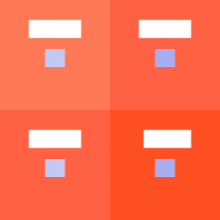 each, as well as a fixed base shelf. One particularly handy feature is that these wall organizers include an open channel so you can thread through an electric power cord, for example, if you wanted to keep you rechargeable drill powered up. On the downside, they don't lock. But, overall, buyers have said that they are durable garage storage wall cabinets. This hanging storage box cabinet offered by Goplus is well-made, handy and convenient for organizing your tools. Users love the price and the elegant black color, but some do note that they had problems assembling the cabinet. The wall mount tool box measures 47” x 7.9” x 23.6”, and it features three storage spaces – two spaces with a door and once with no door. The hanging cabinet tool box also has six adjustable shelves with resistant support hardware and a weight capacity of 110 lbs. Each door has a lock and a key for additional safety. The hanging system is strong and tested so that you don’t have to worry that the cabinet will fall on the ground. In general, users don’t have any major complaints regarding the functionality, design, and stability of the Goplus black wall mount cabinet. A buyer comments that the hanging storage box is made of durable and sturdy material and that it stays firmly attached to the wall. A reviewer adds that he finds the tool box very useful and that it’s perfect for a garage or a workshop. However, the purchaser notes that the assembly instructions are badly written and that it’s impossible to follow them. He states that the hanging tool cabinet takes too much time to assemble without proper instructions and that you need to be very handy to figure how to do it. This hanging storage cabinet offered by Storehouse is stable, sturdy and suitable for anyone that wants to save space in his workshop. Users love the price and the provided storage space, but some do note that they had problems with the package. This hanging tool box measures 48″ x 24″ x 8″, and it features three storage compartments and two keys. Each compartment measure 23-3/4″ x 15-3/4″ and it has two shelves inside. The Storehouse cabinet is made of 20-gauge steel, and it also has a baked enamel finish and a weight of 27.70 lbs. In general, users have a mixed opinion of the Storehouse wall hanging tool box, and they agree that the design and the packaging need improvement. A purchaser shares that the cabinet is well-made and that it can hold a reasonable amount of tools and gadgets. However, the reviewer adds that hanging storage box doesn’t look suitable for heavy materials. A buyer comments that the toolbox is handy, reliable and stable and that it suits his needs perfectly. But he states that it’s hard to assemble it. Other unhappy customers have complained that the package they received was missing the necessary hardware and that the doors don’t line up as they should. A user advises that you check the package on arrival to make sure that everything is in order. This hanging tool box for workshops offered by Edsal is well-designed, spacious, and perfect for storing supplies and tools. Users love that the cabinet doesn’t require assembling, but some do note that they received a defective product. 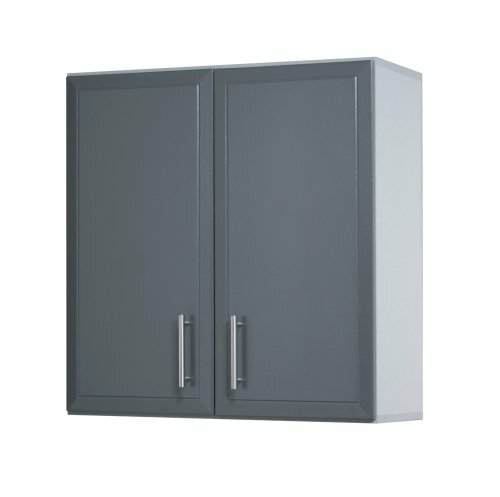 The industrial gray wall mount cabinet measures 24” x 30” x 11”, and it features built-in tool racks, trays, a central pegboard for hardware and tools, a gray powder coat finish, and two hinged doors with a magnetic catch that holds the doors close. There are hasps on the doors that accommodate standard padlocks. The hasps require assembly, and there are instructions included in the package. As a whole, buyers have a mixed opinion regarding the Edsal gray steel tool cabinet, and they state that the metal is thin and flimsy. A user comments that the cabinet looks good, but the doors bend easily and that the included pegboard hooks are not the correct size for the holes. The reviewer adds that it’s questionable whether the wall mount toolbox will hold heavy supplies and that he plans to modify the cabinets extensively. He doesn’t recommend it to anyone who wants to use it for anything other than light material. Another customer mentions that he received a scratched cabinet and that he had problems with the hinge pins. On the other hand, a happy buyer states that he is satisfied with the functionality of the steel tool box and that it’s well-made and sturdy. This 2-door wall hanging cabinet offered by Closet Maid is sturdy, elegant, and blends perfectly with any interior. Users love the gray color and the stylish handles, but some do note that the cabinet is overpriced. The ProGarage wall tool box has a ¾-inch construction, one adjustable shelf, and brushed steel handles. It measures 12.5 x 24 x 32.3 inches, and it also features a weight of 50 pounds and 6-way adjustable hinges for door alignment. This 2-door wall cabinet is made of 5/8-inch industrial grade laminated wood, and the doors have a stain, scratch-resistant powdered finish. A customer comments that it’s easy to assemble the 2-door wall cabinet and that the finish on the doors looks nice and durable. However, he adds that the package was damaged on arrival and that he doesn’t think that the cabinet would last for a long time. Another user shares that the Closet Maid tool box is a great solution for organizing his garage, but that it’s smaller than he expected. A buyer also states that he likes the design and sturdiness of the hanging tool cabinet, but initially he received a damaged product with missing instruction and hardware. 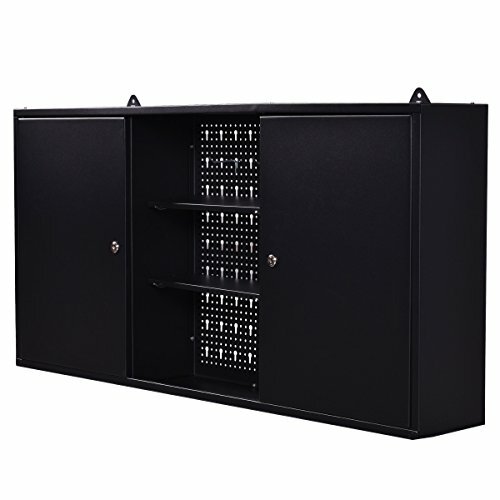 A purchaser mentions that he is very satisfied with the functionality of the wall mount storage box and that he has purchased several of these cabinets. However, he doesn’t recommend it for heavy tools or supplies. He also complains that one of the packages was missing the necessary hardware. If you are searching for a well-made and reliable wall storage cabinet, you might take a look at this hanging tool box offered by South Shore. Users love that the hanging toolbox is relatively easy to assemble, but some do note that it’s expensive. The South Shore wall storage box measures 11.8” x 39.5” x 31”, and it features a strong and tested hanging system, two adjustable shelves specially enhanced to hold up to 35 pounds, one fixed shelf that can withstand 45 lbs, a weight of 69 pounds, and doors with stylish metal handles. You need two people to assemble the cabinet, and it has a 5-year limited warranty. A buyer comments that he is very impressed with the quality of the South Shore pure black storage tool box and that he highly recommends it. He advises that you follow the instructions carefully, and you won’t have any problems to assemble it. Another customer shares that the instructions are very detailed and that it’s easy for two people to lift and hang the cabinet. He also adds that the package arrived in perfect condition and that he doesn’t have any complaints. However, some customers have complained that the quality of the wall storage box is questionable. A user states that he used the cabinet only for light supplies like spray paints and rags, but after ten months the shelves started to sag and bend. The first wall-mounted hanging toolbox we took a look at was manufactured by GoPlus. 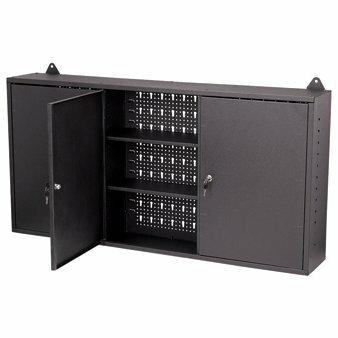 This small, locking storage cabinet includes two storage areas that are divided into three different adjustable shelves located behind each door. The adjustable shelving is designed to be highly secure using strengthened support hardware. One reviewer we spoke with, who had purchased tool cabinet plans in the past for his own DIY builds, describes this hanging wall cabinet as a durable and well-designed option that ships with substandard instructions. Buyers we interviewed cautioned that if you end up purchasing this model, it will definitely help if you are intuitive and handy with tools- because the instructions do not provide you any detailed guidance around its assembly. The second hanging tool cabinet we examined was the Storehouse model- it's built from 20 gauge steel and measures 48" x 24" x 8". The manufacturers say it includes an enamel finish, two shelves in each of its compartments dividing up the three cabinets into three separate areas, and ships with a pair of keys. Buyers we interviewed say that like the other models we have examined they are difficult to put together on account of the inadequate assembly instructions that ship with these hanging tool cabinets. The third hanging wall to wall cabinet we examined is manufactured by EDSAL. It measures 24" x 30" x 11" and the manufacturers emphasize that it is designed to house tools, with a built-in tool rack, partition trays, as well as a pegboard for hanging hardware, hand tools and other types of supplies. The pair of hinge doors include magnetic catches so that they will grip of closed. Buyers say that this small woodshop cabinet can be mounted on the wall or even stored on a bench, helping to securely house keys, tools, pesticides- anything smallish and lightweight. Reviewers we interviewed say that these hanging tool cabinets help to organize their work areas, clearing out a lot of clutter and enabling them to house a lot of miscellaneous items in one secure, and easy-to-access area. As we have seen, these metal hanging tool cabinets generally feature mounting capabilities, adjustable shelving, pegboards, locking mechanisms and are frequently employed in tool shops, educational facilities and in industrial areas. Buyers, however, have told us that they are for the most part dissatisfied with this option- criticizing the weak build, its tendency to buckle when mounted, the poorly machined hinges, inadequately sized pegboard hooks, the warped pegboard itself, and the wrong-sized mounting screws. Use a tool cabinet plan and build it yourself, some say. Indeed, buyers have overall found this hanging wood cabinet to be a weak and flimsy option, too inadequate to function as a reliable component of their work area storage. Another buyer concurs with the general sentiment that the build is inferior-saying that it is manufactured from extremely thin sheet metal, which defeats the purpose of its locking mechanism. The fourth option we took a look at is the ClosetMaid woodshop cabinet- it is built from a laminated wood that is 3/4" thick with a single adjustable shelf and steel handles. The manufacturers advertise it as a dynamic storage solution for garages- and its scratch and impact resistant surfaces are engineered for long-term use. One issue buyers had with this hanging two-door woodworking shop cabinet is that in shipping, the items arrived damaged, causing frustrated homeowners to have to ship it back- a real hassle considering the size of this unit. Buyers do endorse the quality of the door handles and the ease of assembly, which is a departure from the other items we reviewed that were highly resistant to assembly. One reviewer says that, in general, he is satisfied with these hanging tool cabinets, but he cautions other buyers that if you are going to be storing heavy-duty objects in your tool cabinet these are not the cabinets for you. Instead, he advises you consider them as a storage area for lighter-weight objects like spray paints, washer fluid, motor oil, car wax-things like that. The last hanging wall cabinet we examined is manufactured by SouthShore- it includes two adjustable shelves and is advertised to fit in above a base storage cabinet. 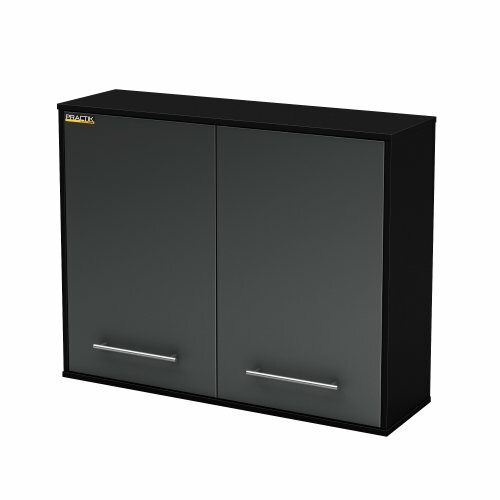 They also recommend that this locking tool cabinet be used in residences- best in the basement or garage to help you organize your work area. It ships with a hanging system to firmly affixed to the wall and its shelving can sustain between 35 and 45 pounds. Buyers say that behind its doors there is a pair of adjustable shelves and the doors themselves are fitted with nickel-finished metal handles. The Canadian manufacturers do advise that two people at a time work to assemble this- and it will require some basic-level capacity with tools- those tools are not included, so make sure that you have some basic supplies to mount this hanging tool cabinet. Buyers supply the mixed feedback for this, with one reviewer criticizing the poor quality of the cabinet hardware- saying that as soon as it was mounted on the wall it became warped and sagged. Other reviewers have piled on, criticizing the joiners for their weakness, the poor-quality of the hinges and the overall inferior construction of its build. Another reviewer who was initially pleased with this shop wall cabinet said that after a couple of months they began to sag in the middle, particularly it's interior shelving- and he says he didn't even overload the shelves, so he's completely surprised by its breakdown. He had been storing spray paint, rags, lightweight hand tools inside of this-not heavier duty items that would seem inappropriate to store. However, other buyers have had more positive experiences, saying that it was similar to an IKEA product in terms of its ease of assembly and that while the materials themselves are not the best quality, as long as it isn't overburdened with weight it has worked for their garage organization purposes.